Attention KISS Navy! For 40 years, KISS has been in the business of rock and roll, recruiting legions of fans from all walks of life and every corner of the globe. The time has come to take on your next mission which will surely be the most epic adventure the high seas have ever seen... 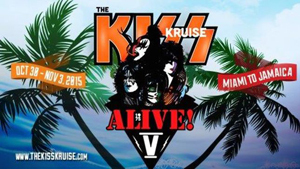 The KISS Kruise V! Gene Simmons, Paul Stanley, Tommy Thayer and Eric Singer will be sailing from Miami to Jamaica, October 30 – November 3, 2015 aboard Norwegian Pearl, the central hub for all KISS maniacs worldwide.